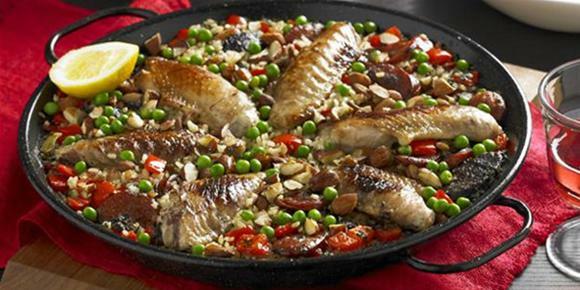 Celebrity chef Miguel Maestre adds a modern twist to a traditional paella, marinating turkey in sherry and juniper. Ideal served with chilled sangria and shared amongst friends for a leisurely weekend lunch. 1. To make the sherry and juniper marinade, combine all ingredients in a large bowl. Add turkey wings. Toss to combine. Refrigerate, covered, overnight. 2. The next day, drain turkey wings and pat dry with absorbent paper. Discard marinade. over high heat. Cook the turkey wings, chorizo and morcilla, for about 2 minutes until golden brown. Remove and set aside. Reduce heat. 4. Add remaining oil to same pan. Add thyme, marjoram, oregano and garlic. Cook, stirring, for 2 minutes – be careful not to burn the garlic. 5. Stir in sherry, saffron, almonds, capsicum and stock. Season with salt and pepper. Bring to a simmer. Add turkey wings, chorizo and morcilla. Sprinkle rice evenly into pan. 6. Cook, over medium heat, without stirring for about 25 minutes or until stock has been absorbed and rice is almost tender. Reduce heat to low and cook for a further 3 minutes to form a nice ‘soccarrada’ (a crust on the bottom of the pan). If the hot plate is not as big as pan, move the pan around a little during cooking to ensure even heat distribution. Blanch peas and scatter over the top at the end of cooking. Tip: Do not use frozen turkey meat as it will be tough – fresh is best. What is your favourite Spanish recipe?